Another brilliant TED talk… this time from Chris Jordan who shows his fantastic art which depicts some shocking statistics. What I liked most about this talk was his passion about highlighting our lack of a sense of anger and outrage about some of the horrific things happening today. It’s the school holidays in our part of the world and for some Indiana Jones related culture we visited The Burrell Collection in Glasgow to look at the excellent collections from Egypt, Rome, Greece and Asia. 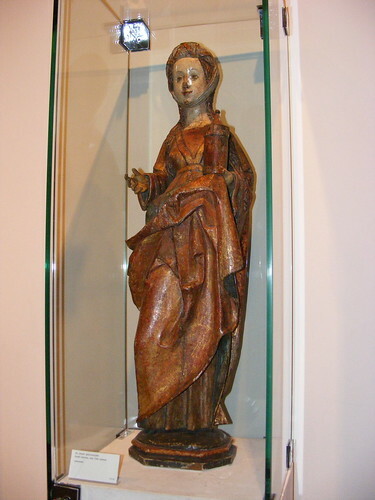 The statue shows Mary Magdalene with the jar of perfume that she was to anoint Jesus’ head with. The thing is… it was Mary of Bethany that anointed Jesus. They were not the same person. Isn’t it amazing how popular misconceptions become so ingrained in cultural understanding? I met with an old friend (as in someone I’ve been friends with for ages not that he is old) I haven’t seen in years today. Clive was a student of mine, then a colleague for a while, then someone who’s band I booked and told people about and then we lost touch. Facebook to the rescue! We met, interestingly, at Edinburgh’s National Gallery of Modern Art. I say interestingly because Clive now works for UCCF working with students around issues of art and theology and culture. We got talking about the Christian artistic ghetto and the oddity that is contemporary christian music (CCM). I have to say I’ve never understood CCM. It is a niche marketing ploy as far as I’m concerned, usually by people who aren’t good enough to cut it in the real music business. Harsh? I don’t think so. Why do ‘Christian’ artists, not just musicians but lots of artists too, feel the need to explain their work? Surely as soon as you start to explain art it looses some of it’s transcendent quality. Surely if art is too obvious it becomes bland and less than engaging. There are some great artists out there who have faith and live in the world and write, sing and paint their world without sticking a fish or a cross on everything so people know it is ok to buy it. I like to think. I like to be drawn in, challenged, moved and engaged by art. That is what art is for. If it does any of those things then surely that is good art and it will speak to me of God because God is in the world that art depicts. And Edinburgh… when will you stop charging for entry to galleries? Art is for everyone and we have paid for it already through our taxes! Follow Glasgow and London and make entry FREE!